When trying to win an ice cream sundae or milkshake challenge, both loaded with very cold substances, you need to understand how to effectively minimize the risk of getting brain freeze. Nothing will ruin your enjoyment of a delicious 5,000 calorie bowl of ice cream or gallon of milkshake quite like a painful and intense brain freeze. An “ice cream headache” or “brain freeze” is caused by quickly eating or drinking cold substances, and it is experienced when those cold substances (ice cream, milkshake, Slurpee, etc.) touch the roof of your mouth, or palate. The roof of your mouth is filled with nerve endings and receptors, and a brain freeze is the direct result of the rapid cooling and rewarming of the capillaries. We will keep the scientific portion to an extreme minimum, but basically the blood vessels contract in response to the cold substance in an effort to prevent loss of body heat. As the coldness recedes, the blood vessels relax again, quickly increasing blood flow to your brain. This sudden reaction is what causes the intense headaches. 1. Do NOT use a straw to drink milkshake and melted ice cream – No matter how you do it, your main goal is to keep the cold dairy away from contacting the roof of your mouth. By drinking through a straw, you are giving that milkshake and melted ice cream an open “golden ticket” to touching the roof of your mouth. Using a straw is almost a guarantee that you will get brain freeze. Use a spoon or pick the container up and drink it instead. 2. When using a spoon, flip it over when it enters your mouth – As recommended in How To Win An Ice Cream Challenge, you should use an extra large spoon during sundae challenges so that you can scoop as much ice cream or frozen custard into your mouth as you can at one time. You will be able to eat more ice cream at a faster pace and win the challenge. If you are not careful though, this quick eating can lead to brain freeze. You can easily prevent this from happening by flipping your spoon over as it enters your mouth. By doing this, you are putting the plastic or metal from your spoon in between the ice cream and the roof of your mouth. Swallow the ice cream while pulling out your utensil and the ice cream will never have even touched the roof of your mouth!! This will also help you clean all the ice cream off your spoon so you can dig it back in and get more. 3. Drink your milkshakes rather than using a spoon – Did your parents ever tell you to “Quit playing around with your food and just eat it?” Using a spoon to consume a milkshake is definitely playing with your food. During milkshake challenges, you are given a spoon, and you of course have the option of using it, but really it should only be used to stir up the milkshakes to make them more “runny” and drinkable. Using a spoon is definitely recommended over using a straw, but that will take way more time and effort than just simply picking each milkshake up and drinking it. By chugging the milkshake, you are basically sending it directly to the back of your throat so that it can quickly be swallowed. It will barely have a chance to contact the roof of your mouth. Using a spoon allows the ice cream to linger longer which just increases your chances of getting brain freeze. 4. Drink warm water or coffee during the challenge – Water has a high “specific heat” and can transfer energy (heat) to other substances very quickly, so it is highly recommended that you drink warm water or coffee along with your milkshake or ice cream challenge. If you begin feeling a brain freeze sensation developing in your mouth, quickly take a drink of your warm liquid. You will notice that the liquid quickly warms the temperature of your mouth back up to normal so that you can happily swallow the substance and continue eating. Sometimes I immediately chase my big bites of ice cream with warm water just to make sure I don’t get any short feeling of discomfort. I do this when drinking milkshakes quickly too. Out of all the tips in this article, this is definitely the most important one to remember. If you do end up getting an intense brain freeze, which may happen of course, just take a quick break and sip your warm water or coffee. This will be much more effective than covering your mouth and breathing quickly or pressing your thumb up against your palate. You will definitely have to request the warm water, just like you will have to request the hot coffee (if you like coffee with ice cream), and you will probably get a weird look from your server. If they bring you water that you feel is not warm enough, you may need to take your cup into the bathroom and pour your own hot water from the faucet. I’ve done that before!! Those are the main 4 main things that you can proactively do to prevent getting a serious brain freeze. 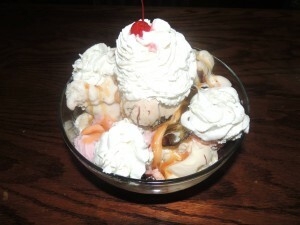 For more tips regarding ice cream challenges, please check out our How To Win An Ice Cream Challenge article and video. To see three of the four tips put into action during an actual milkshake challenge, check out this video below. A few years ago, I attempted to break the time record for the Crown Candy 5 Milkshake Challenge in St Louis, MO. I had to drink 120 ounces (8 oz short of 1 gallon) of freezing cold milkshake in less than 3 minutes, something that Man v Food host Adam Richman could not do in less than 30 minutes. To drink the milkshakes that quickly, I not only had to specifically train for it, but I also had to do everything I could to avoid getting brain freeze. I drank the milkshakes straight from the metal containers, stirred them with my spoons, and I chased them down with warm water when I needed to. Follow the four main tips above and you will avoid getting brain freeze too.